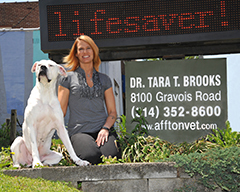 As a veterinarian for more than 10 years, Dr. Brooks has always had a passion for all animals and has been an advocate for those that would otherwise have none. Taking in dozens of animals over the years, Dr. Brooks heart continues to grow. She has one of the largest hearts that you will ever see in a veterinarian. Over the course of 10 years Dr. Brooks has given out of her own pocket over $100,000 to support owners and animals that do not have the resources to care for animals that require an emergency surgery. It is with this mindset that Hope Mending Hearts became a dream of Dr. Brooks. Dr. Brooks has worked extraordinarily hard to establish a 501(c)(3) that will encompass the love and compassion she has for veterinary medicine. By providing the service of offering grants to owners that are financially struggling, animals that are in urgent need to receive care can be helped. Owners will no longer have to contemplate euthanasia when the animal can be healthy after the emergency surgery. The whole idea is to pay it forward. If you like to know more about Dr. Brooks and Hope Mending Hearts, please don’t hesitate to contact her at HopeMendingHearts.com.